I have another great holiday shopping opportunity for everyone this week! I’m super excited about this one too because it’s for a $25 gift certificate to My Baby Clothes Boutique and they have some of the cutest thing for the little one in your life!! I’ve spent a lot of time browsing around their site and probably have a list that has a total cost that’s more than my weekly paycheck! The best thing though is that I’m lucky that I have a little boy or I’d seriously be in debt! I love hats for babies and My Baby Boutique has some of the best ones I’ve found! There are two in particular that I really want to get my little guy! 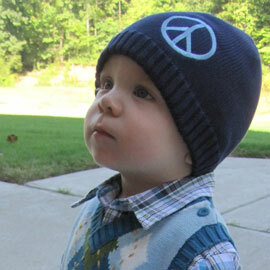 The peace sign beanie hat is my first choice right now since it’s getting colder here in Michigan and it’s adorable! Not to mention I’m pretty sure that my older girls will love it on him too! This is my choice from spring and summer! 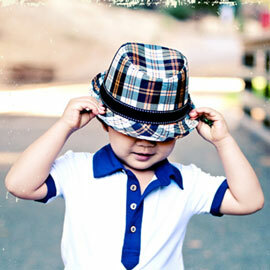 There are a few choices for the fedora style hat too, but this one just looks summery and fun to me. Now, for the little girls in your life there are some incredible hats as well! Even better are the cute tutu’s and headbands! Tell me what you what you’d get with the gift certificate and for who. That’s it! Nothing else! Just leave a separate comment for each and you’re entered twice automatically! If you want an extra entry tweet the following and leave me a direct link to it on your profile in another comment. The giveaway ends November 25th at midnight and a winner will be drawn via random.org and will be notified on November 26th.